The Nord Stream 2 project will play into the hands of both Berlin and Washington, RIA Novosti contributor Dmitry Lekukh writes, adding that the West may eventually turn its back on Ukraine as a transit state. The journalist regards Foreign Minister Sergey Lavrov's remark, which was made after his meeting with Anders Samuelsen, the сhairman of the Committee of Ministers of the Council of Europe, Minister of foreign Affairs of Denmark, as a potential sign of change. Lavrov told reporters that Moscow hopes that Denmark will consider Russia's appeal for the laying of the Nord Stream 2 pipeline in accordance with the laws which were in force at the time of filing the appeal. In November 2017, Copenhagen passed the law that could allow the country to ban Russia's energy project. Lekukh suggests that Moscow has a good chance to come out on top in this argument. Yet another sign, according to the journalist, is the recent article published in the US influential Foreign Policy magazine by Brenda Shaffer, an adjunct professor at the Center for Eurasian, Russian, and East European Studies at Georgetown University and a nonresident senior fellow at the Atlantic Council's Global Energy Center. The Atlantic Council is largely seen as a neoconservative think tank with a critical view on Russia, however, Shaffer's article with the eloquent title "What's Good for Russian Gas Is Good for America" argues that the US has gone too far by throwing sand in the gears of the Russo-German energy project. "Ultimately, Washington's rejection of Nord Stream is a wasteful distraction and a hindrance to American interests," she highlights, citing the Obama and Trump administration's opposition to the project. She insisted that "Europe can't ensure the security of its energy supply by reducing Russian gas supplies," since US liquefied natural gas (LNG) exports won't fill this gap due to the significant difference between LNG and pipeline gas prices. Officials from Wintershall Holding GmbH, Shell, Nord Stream 2 AG, Gazprom, ENGIE SA, Uniper SE and OMV AG signing the financing agreement for the Nord Stream 2 pipeline project. Moreover, in the long run Brussels' US-backed effort to obstruct Nord Stream 2 by imposing strict rules on import pipelines outside Europe "would hurt [the continent's] security of supply and deter producers who seek to export to the European market," she warned. The Atlantic Council's fellow noted that attempts to pressure Russia into delivering its gas to Europe through Ukraine undermine the EU energy security. On the other hand, "the expansion of the Nord Stream pipeline would indeed mean that the far more stable Germany would replace Ukraine as a transit state for some of Russia's exports," she wrote. Additionally, US decision makers need to keep in mind that Nord Stream "doesn't only have strong support in Moscow, but also in Berlin," the American scholar underscored and recommended Washington "carefully choose its battles with its allies in Europe." According to Lekukh, Berlin is indeed interested in supporting the Nord Stream 2 project and with good reason. However strong Berlin's support for Ukraine is, it is clear that once the Turkish Stream gas pipeline becomes operational, Ukraine's role as a transit state will fade into oblivion, the journalist noted. Under these circumstances it is up to the German leadership to decide who will become Europe's major energy hub — Germany or Turkey. According to Lekukh, Berlin is unlikely to miss this opportunity. At the same time, Russia is making progress in producing its own LNG, the RIA Novosti contributor remarked, citing recent Russian LNG shipments to the United States. The journalist suggested that in the long run Russia may pose a significant challenge to the US on the market of liquefied hydrocarbons, especially if the country's pipeline projects are thwarted in the EU by Washington. "Nord Stream 2 (and then, possibly, both "three" and "four") will be built for one single reason," Lekukh wrote. "The thing is that it benefits all real players including, of course, Russia. Andrei Kruglov, the financial director of Gazprom, said that the positive effect from the removal of gas transit from the Ukrainian route to the future Nord Stream 2 gas pipeline is already estimated at least a billion dollars a year." That means that Germany will continue boosting its economy and the US will not face "excessive and quite real" competition in global LNG markets from Russia, the contributor concluded, admitting that at the same time, Ukraine will obviously lose its transit fees as well as some leverage over Moscow. 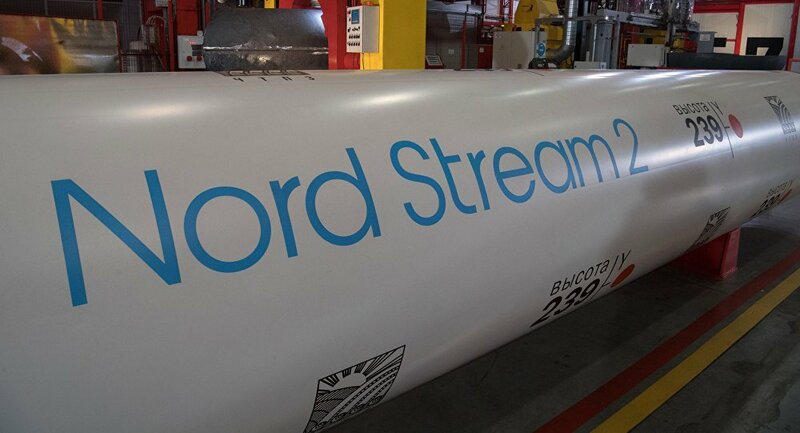 Nord Stream 2 is a joint project run by Russia's Gazprom with France's Engie, Austria's OMV AG, Anglo-Dutch Royal Dutch Shell, and Germany's Uniper and Wintershall. The project envisages delivering 55 billion cubic meters of Russian natural gas a year to the European Union, through a pipeline across the Baltic Sea to Germany. The views and opinions expressed by Dmitry Lekukh are those of the contributor and do not necessarily reflect those of Sputnik.